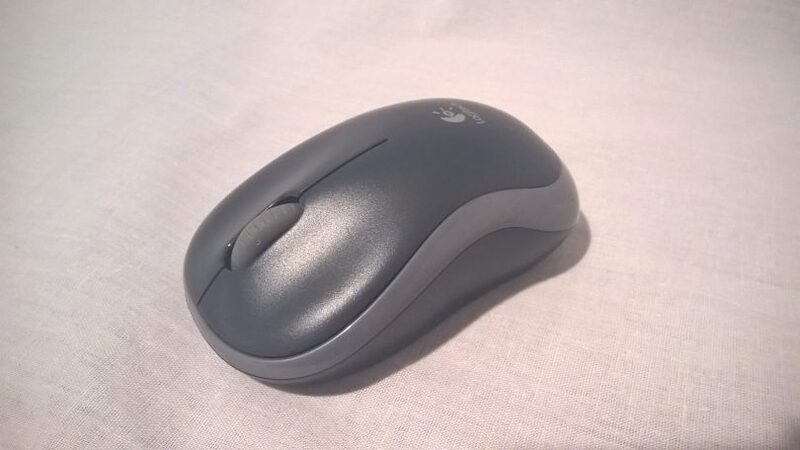 Logitech M185 Wireless Mouse Review – A SFF Mouse?! A few weeks ago, the bluetooth mouse we use for our HTPC failed. 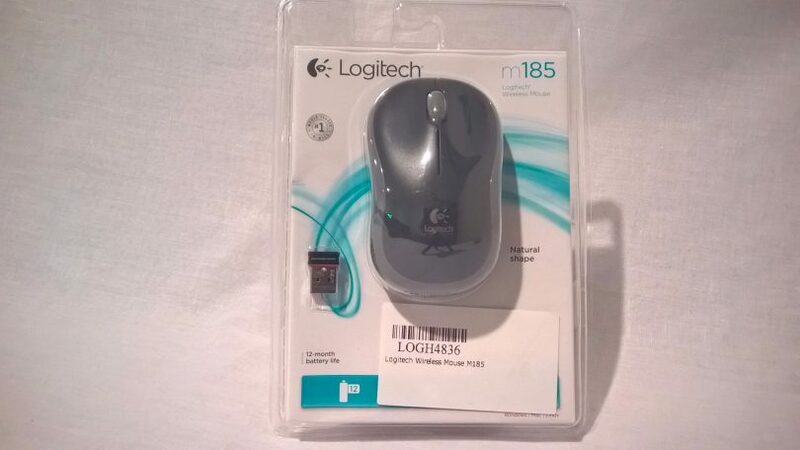 In the search for a replacement (we were never really happy with the previous mouse) the Logitech M185 Wireless Mouse became the chosen candidate. Logitech lists support for Windows Vista, 7, 8, or 10, Mac OS X 10.5 or later, Chrome OS and Linux kernel 2.6+. Of course, the system does need a USB port – 2.0 or above. The mouse comes with a 3-year limited hardware warranty – the specifics of which will vary depending on your locality. The mouse measures 60 mm (2.36 in) high, 99 mm (3.89 in) wide and 39 mm (1.54 in) deep. It weighs (including battery) 75.2 g (2.65 oz). The receiver measures 14.4 mm (0.57 in) high, 18.7 mm (0.74 in) wide and 6.1 mm (0.24 in) deep. Logitech quotes the sensor technology as ‘Advanced Optical Tracking’. This system includes an invisible light source for sensing but Logitech does not specify what type. The mouse has a resolution of 1,000 DPI – rather low when you compare it with gaming mice, but perfectly suitable for a mobile mouse or one used for HTPC duties. 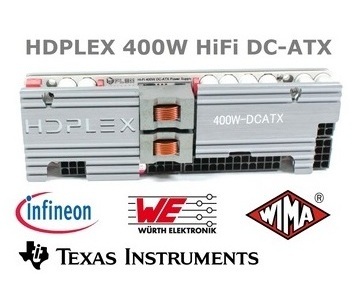 The packaging is your usual dual-display type unit – designed to show off the product while enabling it to be hung from a hook or stacked on a shelf. On the rear we see some basic information about the mouse, including compatibility and features. 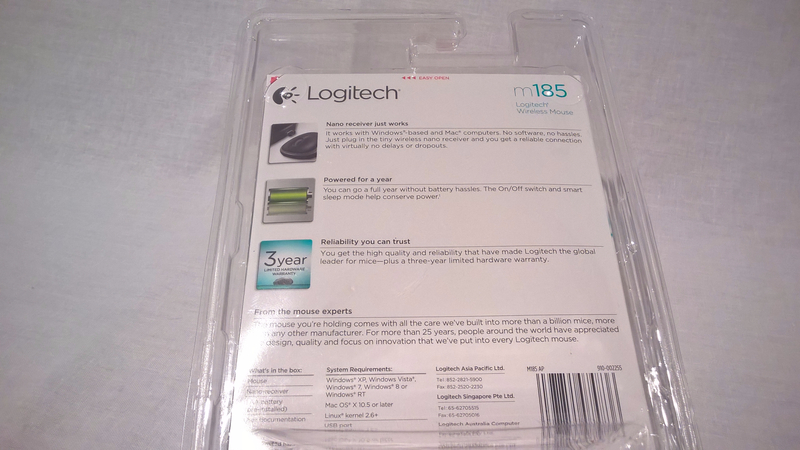 This packaging may look like the usual nasty blister pack, but it does have a serrated cutout for ease of opening. 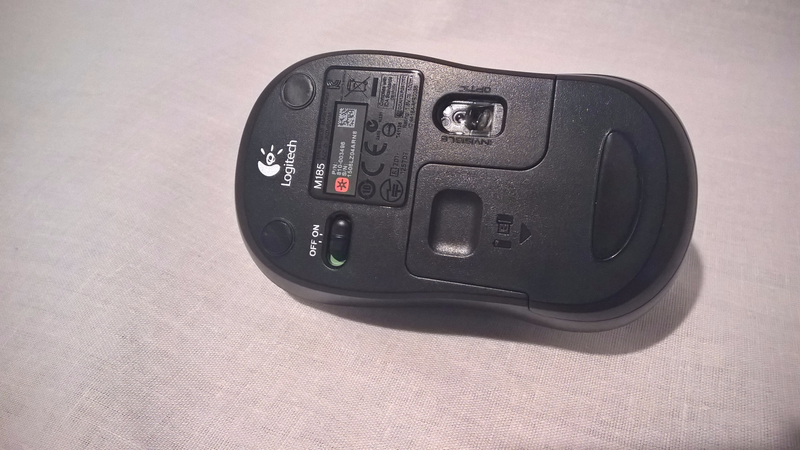 In saying that – once the package has been opened, it will never be the same again, so don’t expect to try the mouse and return it for a refund if you don’t like the shape! This mouse has a tail! In reality, it is a pull tape preventing the included battery from making contact. Also seen here is the nano receiver, a tiny little thing that is at home in the side of a laptop. 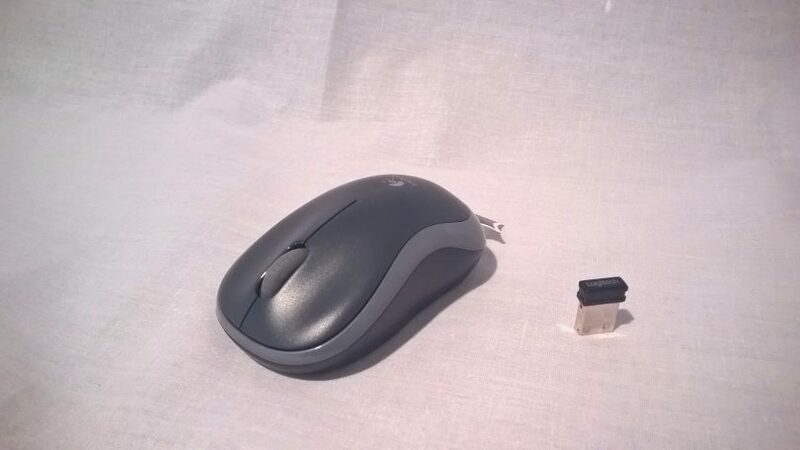 Another view showing that this model is a simple 3 button mouse. Left, right and scroll wheel click. The mouse is comprised of the usual plastic. While not feeling like cheap plastic, it is not coated or painted, so it definitely does look and feel like it fits in the cheaper end of the market. Underneath you can see the optical sensor lens, a manufacturer information sticker and an on/off switch. The switch feels well made, and easy to toggle – a gripe we had with the previous mouse which had a difficult to manipulate switch. In this photo, the mouse is turned on – can you tell? No more flipping the mouse over and seeing a visible light to tell if it is powered on – this mouse has ‘invisible optics’. Because of this, I would have liked Logitech to include an indicator LED of some description – the only way to tell if the battery is low is when it stops working. 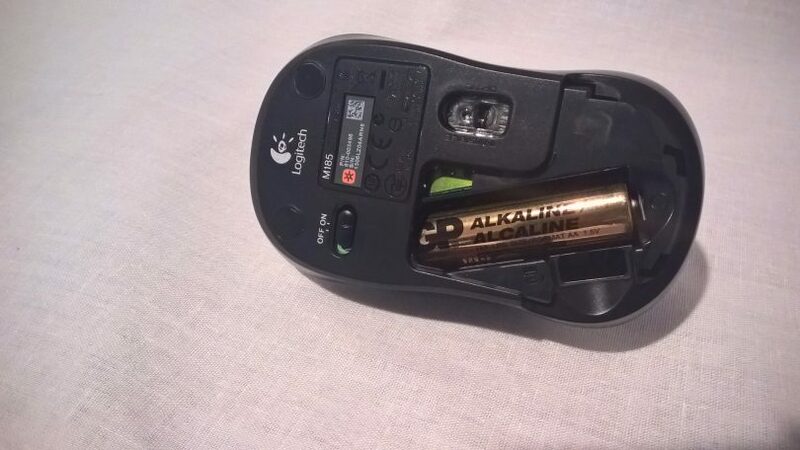 The included battery is a cheap ‘GP Alkaline’ non-rechargeable AA battery. Logitech claims that this mouse can run for up to a year with the power switch and ‘smart sleep mode’. Only time will tell for this promise! It is nice that manufacturers are still using replaceable batteries in devices – I very much dislike the trend towards ‘integrated’ batteries that make the device a throw-away when it fails. Also included in the base of the mouse is a place to store the nano receiver when you are transporting it. Much safer than it hanging out the side of your notebook in your bag. In use, the mouse feels comfortable (only as comfortable as a notebook mouse can get of course) and solid. Even though it feels lighter than the mouse it replaced in our home, it feels like it is manufactured to a higher standard. Range is as promised (10 metres) and response is as expected. The buttons are very tactile, with a very distinct click on activation. My only gripe with the feel of this product is that the scroll wheel detents in the scroll wheel are very light and not that noticeable when scrolling. This is a personal preference of course. The Logitech M185 Wireless Mouse is available at various online retailers, with Newegg stocking it for US$17.49. 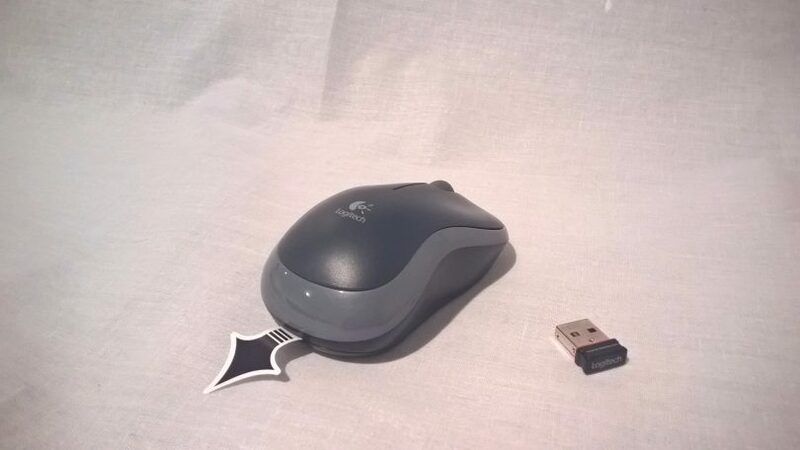 I purchased this mouse for the equivalent of US$12.60 from a local store. As a low-mid range wireless notebook or HTPC cordless mouse, I would recommend this model over others I have tried (Microsoft Mobile 1000, Genius DX-1700, Verbatim Nano).